The Eruption Rain is indeed the elephant hosing himself with his nose. The city is flooded by the rain. Meanwhile Kan & Kin (and the monkey) are on a badly drawn cat, still climbing the left leg of the elephant. The Eruption Rain comes down the leg as well, engulfing them. Kan yells that the drawn cat will melt on contact with water. 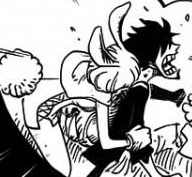 Meanwhile Luffy, drenched from the water, rides the back of Wany with Wanda. Wanda tells him the water isn't actually a rain, it's the Zuneśa (no doubt named after Ganeśa, the elephant god) the Elephant waters himself twice a day, so this is actually sea water. Their city has a purifier in the middle that filters the water, and this supplies their every day water supply. Carrot adds that tons of fish also come down at the same time, so they never starve. Bepo yells out to Luffy that he can't leave the forest, so to tell his captain to head over here. Carrot tells Luffy (white biting his ears) that although Bepo is a native to this land, he's a pirate so he's under the care of the Cat Viper Boss for now. Wanda looks up at the X shaped crucifix in the ruined city, and has a short flashback with tears in her eyes. We see a great Minkman being crucified by Jack, who demands to know where the person he seek is. The minkman tells him he doesn't know what he's talking about. Luffy sees the two minkmen girls depressed, and asks about the man who attacked this land. Wanda replies his name is Jack, and he was reported killed on the newspaper. He apparently attacked the 4 marine ships carrying Doflamingo, and was taken out. He was apparently crazy enough to attack a ship with and Admiral and former Fleet Admiral on it. However, the paper also reports that his death was unconfirmed. Wanda believes he is still alive and out there, and she will never forgive him. Just then, Usopp, Zoro, & co arrives there by Law's shambles. She tells him it's a misunderstanding, and they've just reached the fortress. Wanda tells the guards she has brought the Straw Hat pirates, and that he was the intruder at the Whale Forest and he means no harm. Inside the fortress, Nami is sleeping on a massive fluffy sheep man's belly. Chopper comes crying to Nami, reporting that Luffy has finally arrived. Meanwhile the numerous minkmen in the fortress gets ready to welcome their guests. They chant "Garuchu". Zoro is puzzled, as he was told the minkmen hates humans. The Wanda replies that's just the fear the humans have of other minks. To them, the humans are nothing but a "monkey mink" that's low on fur. She licks Luffy's face again, and says they are proud of their mink-fur, but quite a few do admire the "lesser minks" with beautiful lack of fur as well. Nami is hugged by many minkmen as she comes to meet up with Luffy & co.
Usopp is surprised at how friendly they are. Last edited by Ekila; November 9th, 2015 at 12:26 AM. I want everyone to note, in about ten minutes of time, a Bosnian, a Saudi Arabian, an American, and a Brazilian all sat around millions of miles away from eachother discussing rubber pirate comic books from Japan. You've all had your 21st Century moment for the day, carry one. I am hoping Sanji somehow turned into a mink. That would make him even more perfect. Whoa, that double spread. Zou looks great! Either Brook did something to Sanji to make him seem dead or Sanji interrupted Jack's interrogation and got pummeled for it. Or both. What Woman? Ace was a little kid and she was an adult already, the kid is most likely Shanks. Man, Sanji. Are we going to have a save Sanji arc? Are Brook and Momo with him? Where is Gas guy? Man, this arc is getting good. Considering Oda once said the daddy of Makino's baby is 'likely that man', I'm agreeing that Shanks is likely the daddy. Didn't notice it until you pointed it out. XD Jeez, kinda detracts a bit when looking back at it. 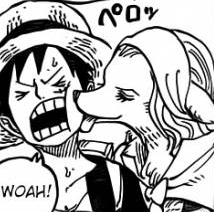 Anyways, seems like Wanda really likes licking Luffy for some reason. I say "some reason", but I guess that's her "thing" as a dog-minkmen. I wonder if she'll fetch. I assume its just her being a dog and her way of showing affection, just like Carrot was biting, Rabbit like to bite things. It seemed odd to me that Wanda licked Luffy's face last chapter, now we know why. I also like that it's as if they arrived at the end of the arc where they are already heroes. going to be intresting to see where things go from here . TLG , FFVIIR and Shenmue 3 2015 the E3 of dreams . You know, perhaps I'm just dumb... but is most of the art in this chapter lousy? I'm guessing Sanji decided to turn himself in or something, and Brook is accompanying him or whatever. Or undead shenanigans with Brook. There's a lot of things that can happen. Are the next two weeks gonna be Wanda vs Carrot debate? My guess is the sheep is the king or similar. I'm not a big fan of the misleading of last chapter especially when we don't have a good explanation for it. And now we have the second stage with Sanji. Maybe he was captured by Jack, anyway this will surely be linked with he mysterious bounty. It looks like this decks from around the world will be stacked a bit more. Good thing too, I didn't want to see each individual one more time. The Swirly Hats certainly saved everyone and built up all that respect and adoration but in the process Sanji sacrificed himself or was out right defeated and captured. I know Sanji will ultimately be fine but the way Oda presented that last scene, wow. I almost got teary eyed. Before this chapter I assumed they were all just hiding out pretending to be dead but now I think something crazy and legitimate actually happened to Sanji. That "I do know of some people that admire lesser Minks such as yourself" remark came off as a little suggestive and flirtatious to me.